Mark Millar recently auctioned off the alter ego of the titular nemesis in Nemesis, his upcoming "Batman as a supervillain" series. 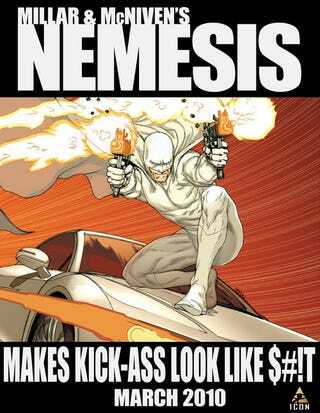 Now he says retailers who display this charmingly profane Nemesis poster win free ad space in the comic itself. The idea is a unique opportunity to retailers where by downloading this poster and sticking it up in their comic-store they will be guaranteed get a free ad in issue one of the book," explained Millar. "Every single retailer who puts up this poster will have their name, address and website listed in what's already Marvel's biggest-ever pre-orders for a creator-owned title. All you have to do for proof is take a picture of the poster up in your store and post the pic on this Millarworld thread with your details. I got to give it to Millar - the man is quickly turning into the Don Draper of comic book store promotions. Retailers: please be dears and don't hang this poster next to the Archie section. I don't know how I feel about kids (and Jughead) being exposed to all this untrammeled Millar-osity.